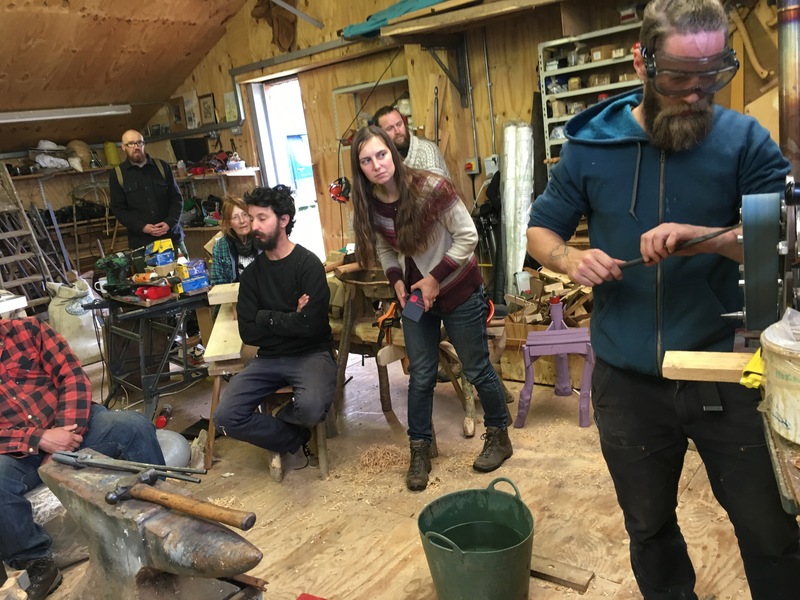 ﻿I’ve just returned from a great weekend in Herefordshire, where a small group of dedicated pole lathe bowl turners met to share tips and celebrate the wooden bowl and various other forms of pole lathe turned vessels. 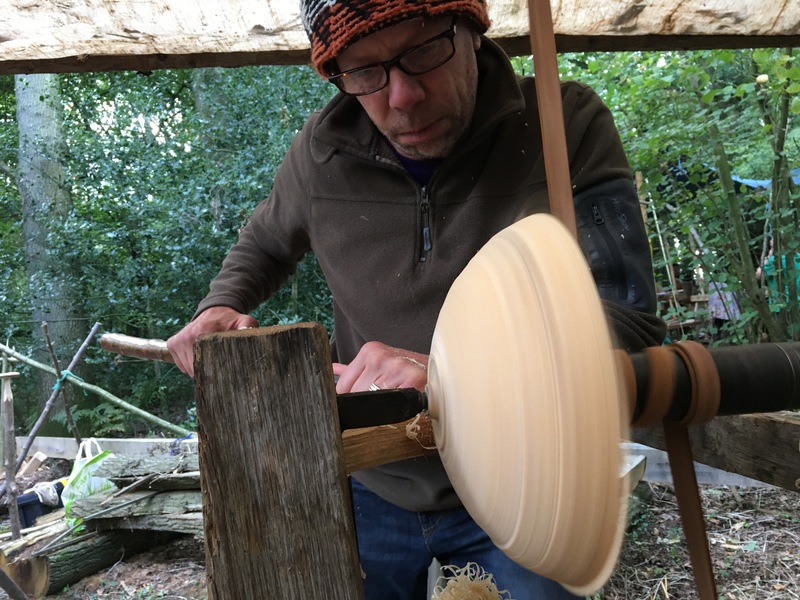 When I started my pole lathe bowl journey almost ten years ago, there were very few people around to discuss the craft with or to learn from. Originally inspired by Robin Wood, I received some helpful advice but no direct tuition from him. Eventually I encountered Terence McSweeny (pictured above, turning a jug at this weekends event), when I stumbled upon a blog he had started. We’d both started bowl turning at about the same time, he’d just moved from his home in Ireland to the UK and we quickly became friends. 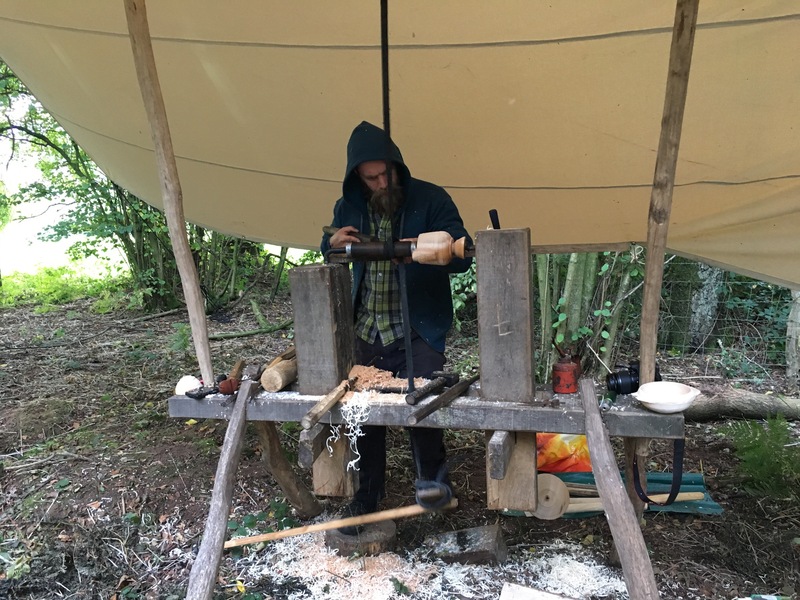 We’d meet up in the woodland where my home on wheels was parked and turn bowls together, forge tools and discuss the various challenges of learning the craft. It quickly dawned on me that he was exceptionally talented and had an inspiring way to quickly gain insight in to subtle nuances which I would only stumble upon through the slow process of trial and error. During those early days I learned an awful lot from those sessions with Terence. Over the next few years we kept in touch but both got busy so met up less often. I eventually began teaching the craft, hoping to provide for others the advice which I had sought to find when I started. Terence is on the cusp of starting to work abroad for some time and is currently in Ireland so it was not clear he’d be able to join us at the bowl gathering, but at the last minute he decided to take his car on the ferry and be there, much to my delight. I knew he would have a lot to offer and he did not disappoint! 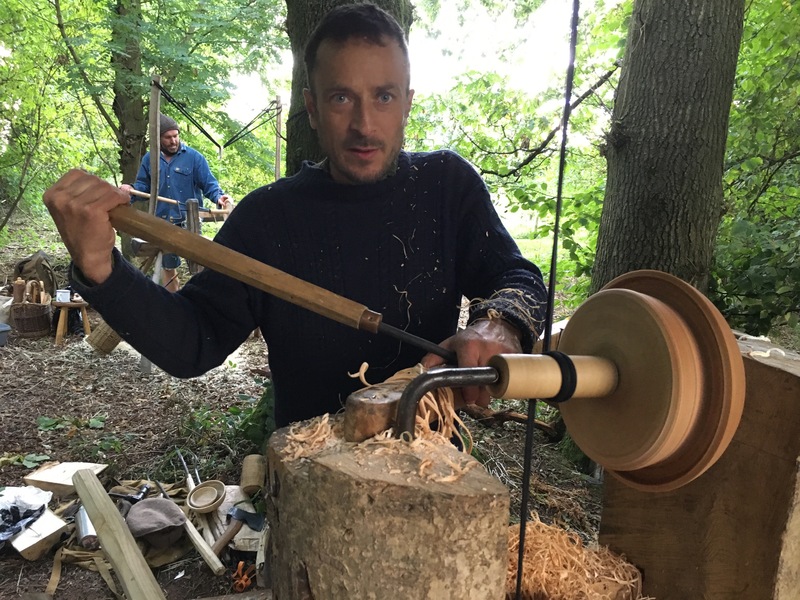 There are now many more people interested in pole lathe bowl turning, with a growing number of full time turners as well as many others who are dedicated but continue to earn their main livelihood in other ways. For the last few years I’ve seen a dramatic rise in the number of bowl turning courses I run here on Dartmoor, many of them incorporating an extra day forging hook tools. 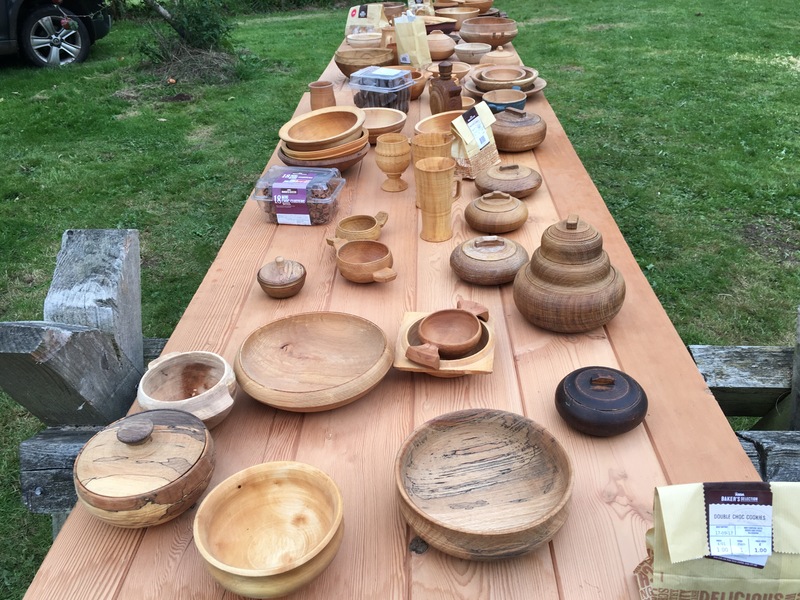 I’ve day-dreamed on and off about hosting an annual gathering to bring all these bowl-mad people together for a weekend event where we can pool our collective knowledge and so reach a deeper understanding of the complexities involved in producing simple wooden bowls and other vessels. 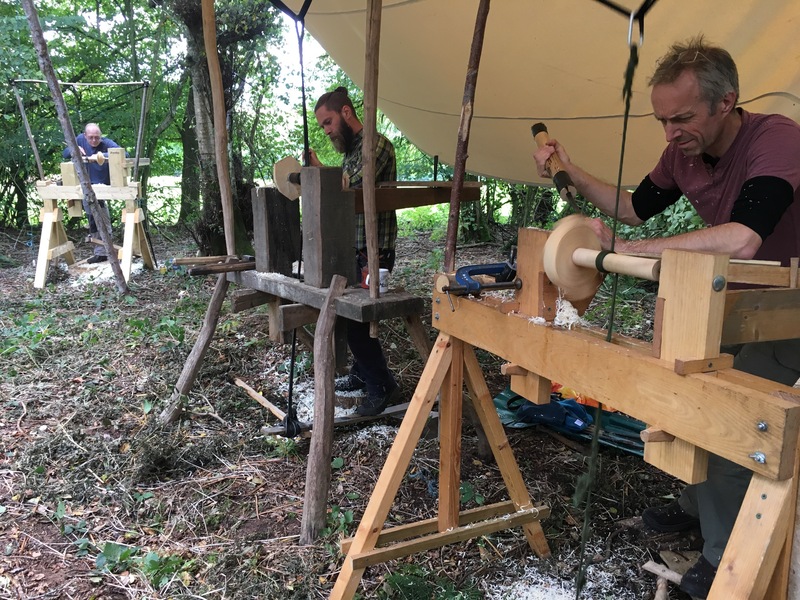 So the weekend rolled around and we all arrived at the meadow and set up our lathes in the wood. 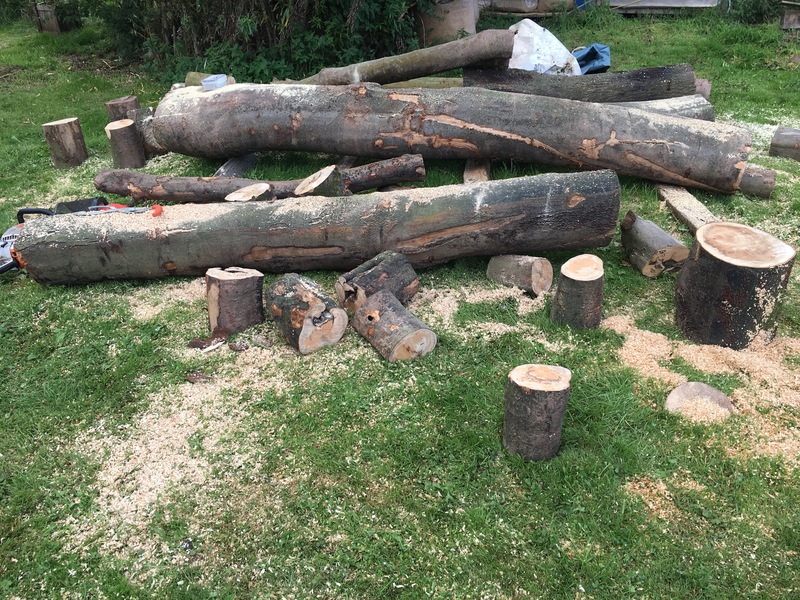 David and Maurice had put in a lot of time getting the site ready with shelters and bowl turning timber, (beech, sycamore and oak). A few of the party had arrived early and set about building a compost toilet. 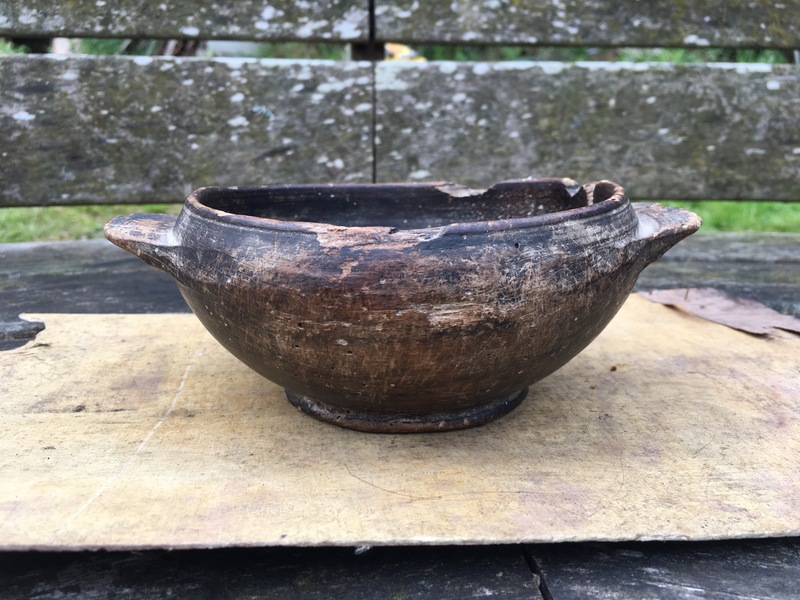 An antique wooden bowl with handles had been loaned to us by fellow green wood worker Martin Hazel. The bowl had come from Breton and we decided to spend some of the weekend trying to copy this sweet little bowl. I was amused to discover that David had cut the profile of the Breton bowl in to the door of the compost toilet! A nice touch which afforded a nice view.. 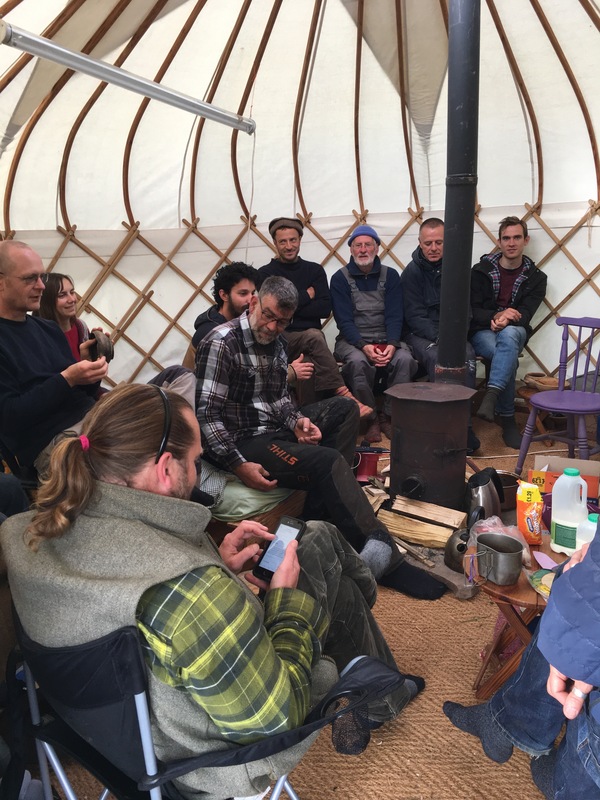 The Friday evening meal, cooked in the yurt, was a tasty vegetable curry, along with a venison curry and rice and popadoms. The woodburner kept us cosy as we all ate and and enjoyed a brew, before a violin and flute were produced and a few tunes were played. Saturday morning we met at 9am for a short de-brief; we discussed the shape next years event might take and created a very relaxed structure for the weekend. Saturday morning was to be enjoyed having fun trying to copy the Breton bowl, then after lunch we’d simply share tips and learn from each other. It was a really fun day with a great atmosphere of light-hearted competition and supportive sharing of ideas and knowledge. After my attempt at turning the Breton bowl I turned a handled mug with my friend Yoav. I first met Yoav a few years ago when he visited me at Steward Wood and came on a few of my courses. 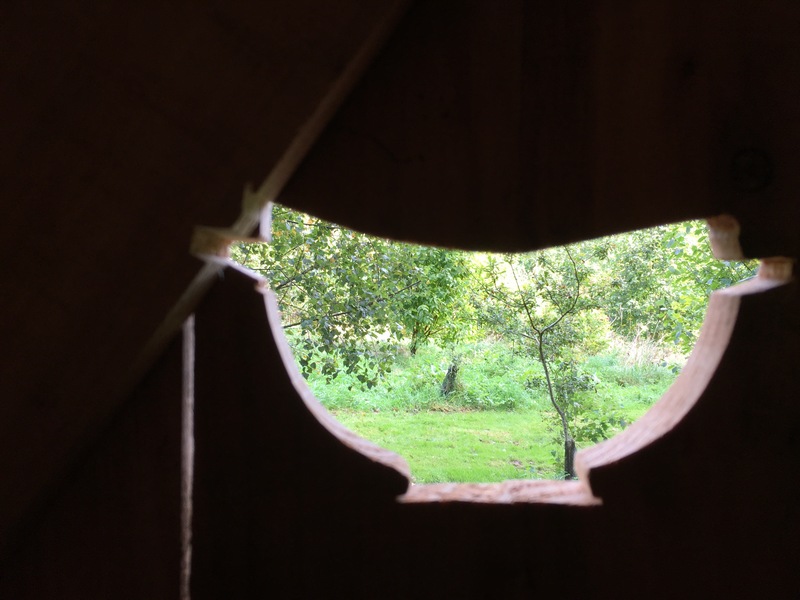 He has since immersed himself in the greenwood world and is producing some really outstanding work, as well as running courses himself. 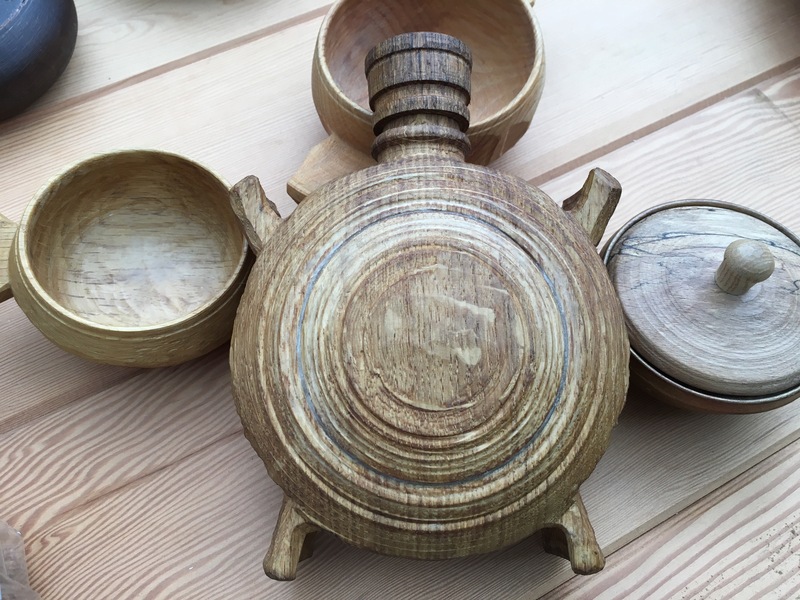 It was such a pleasure to meet with him again after a few years and particularly to see how he has developed a different approach to turning end-grain drinking vessels. I found myself questioning him and realised that adopting a few of his techniques to my own process would be a good idea and this I intend to do. 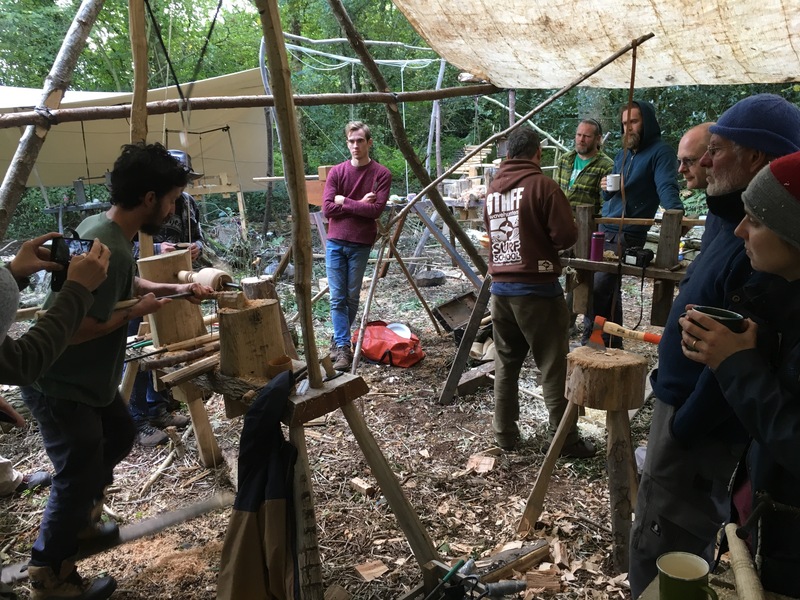 It was useful to try each other’s hollowing tools and try to understand more about what is needed for such specific tasks. It’s all fairly new territory for us at present, this end-grain turning, although at one time the answers we are searching for would have been common knowledge to wood turners. 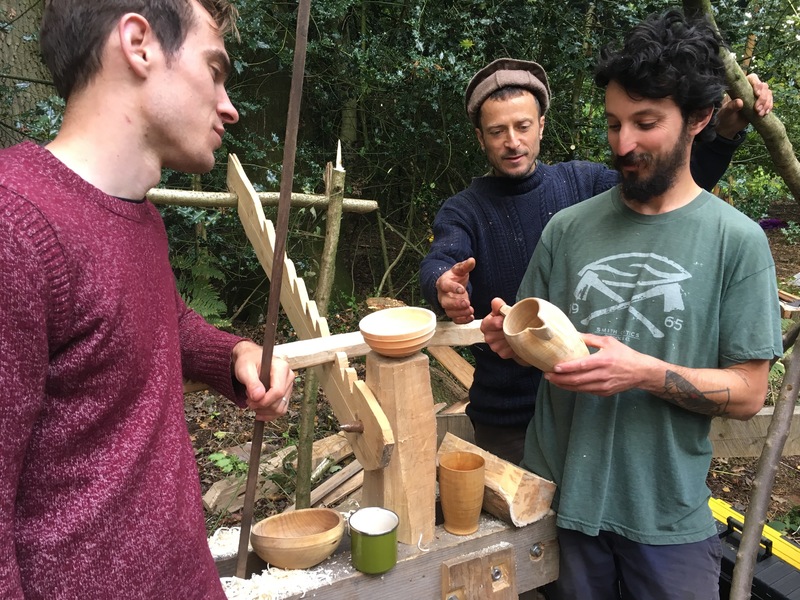 Below, Yoav is starting to shape the cup, cutting around the handle while a few people gather to watch; left to right, Terence McSweeney, Sean Hellman (camera shy for once? ), Adrian Lloyd, Owen Thomas, Jonathon Dowe, Peter Carmichael and Amy Leake aka ‘Woodmungler’. 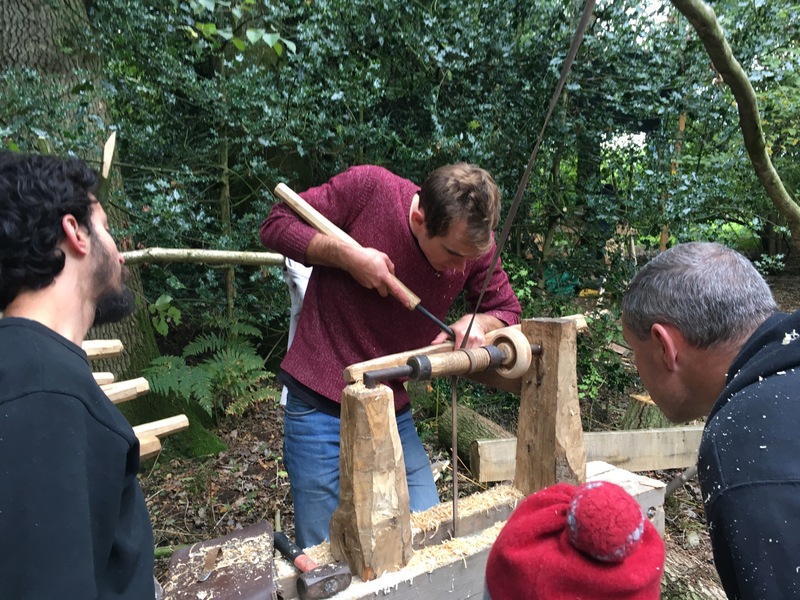 Doug Don (above) brought along 5 lathes so other people, arriving by public transport, were able to have a lathe to use. Here he is pictured carving the handles of his Breton bowl. On Sunday afternoon we all gathered round to decide who had made the best copy and Dougs bowl was easily the closest. Not just the dimensions but the form and the small details were all there in his attempt. Well done Doug! It’s a very interesting process trying to copy someone’s work. It really forces you to look and see; a skill which takes time to develop. 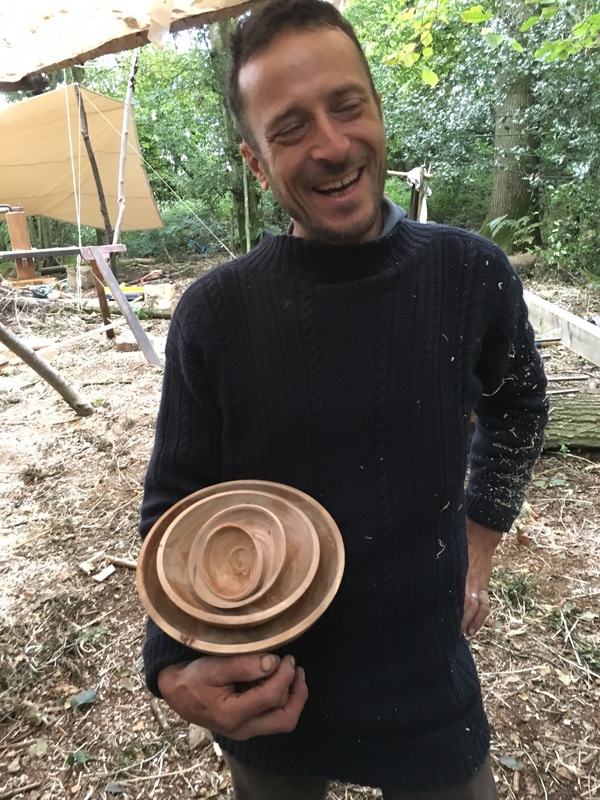 Terence has been doing a fair amount of research, some of which has focused on the Asturias region of Spain where a group of itinerant crafts people used to turn bowls and other vessels on pole lathes, a tradition which continues there today, kept alive by a few passionate turners. Terence noticed that many of the old photos of the turners showed their lathes were set up quite differently to the ones used by English, Irish and Romanian turners, with centres aligned on a diagonal rather than horizontal plane. Terence shared some of his research with us which was fascinating. I won’t divulge here only because he intends to write it up on his own blog so I’ll direct you to that which is well worth keeping an eye on. 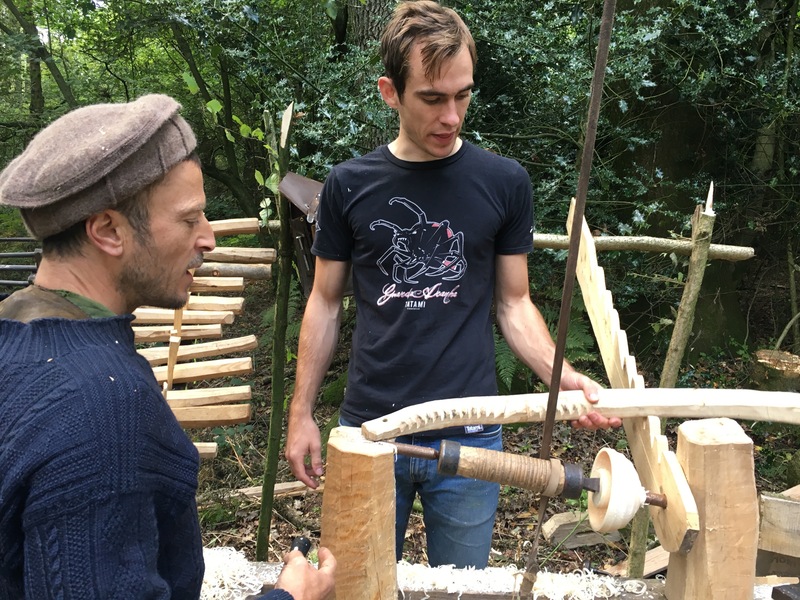 He brought along his adapted lathe (above, with Matty Whitaker looking on) in the style of the Asturian turners to demonstrate how the diagonal centres and the different tool rest allow for easier access without the need for strange shaped hooks. He admitted that he needs to explore the possibilities further but it was very interesting to consider the significance of this approach. 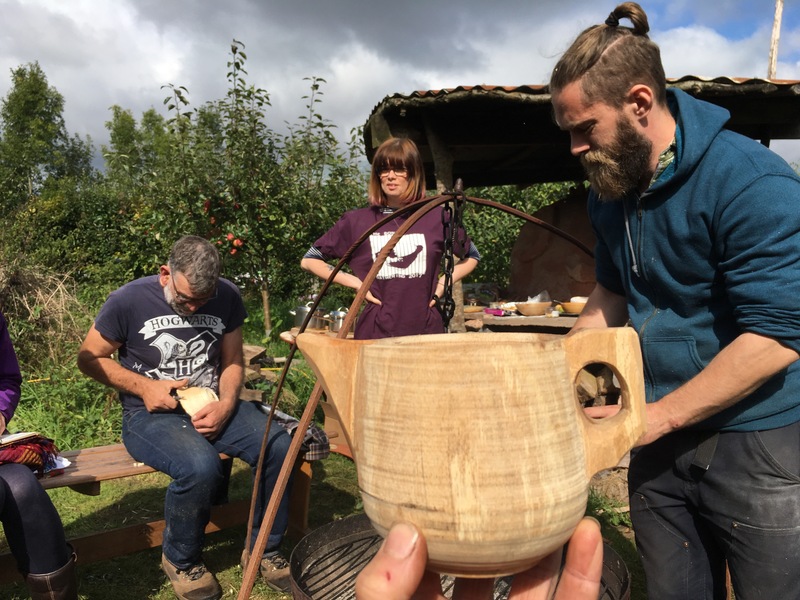 Terence brought along a beautiful jug he had turned and kindly demonstrated how it was made, whilst Owen Thomas busied himself turning a jug of his own. Below is Terence’s jug. 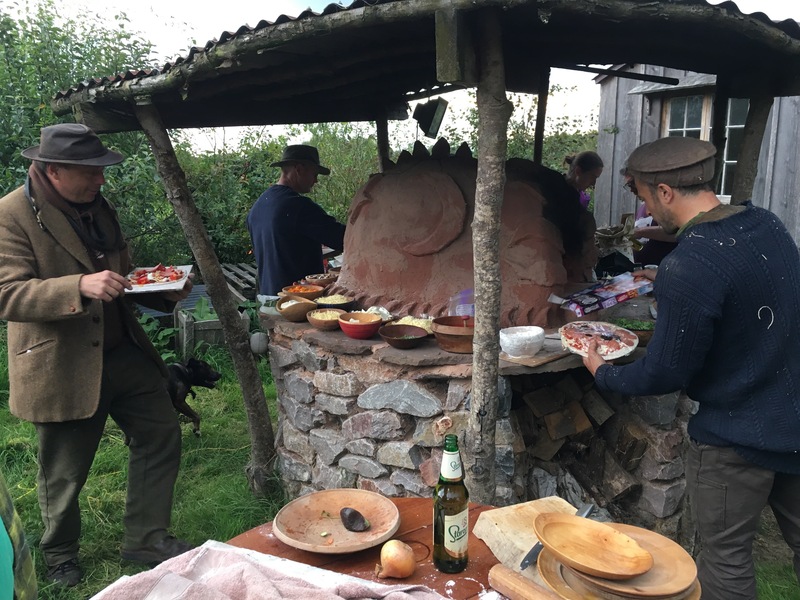 And here is Owen turning his and below that a picture after he had carved the handle and spout…. 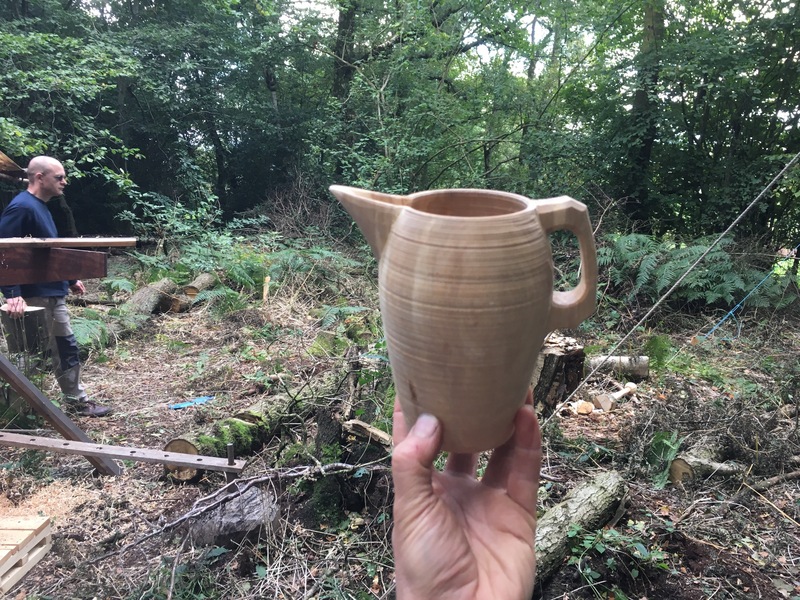 To make a jug like this is quite a lot of work and requires a great deal of skill, it is inspiring to know that there are turners now using a pole lathe to create these when even a few years ago there was not one person in this country who knew how it could be done. The skill and knowledge is rapidly increasing. I wonder if we will once again reach the level of skill attainded by the bowl turners of yesteryear. I can see now that it is not beyond the realms of possibility, although there is a vast difference between someone starting off when very young, born in to the craft and adults coming to discover it later in life. 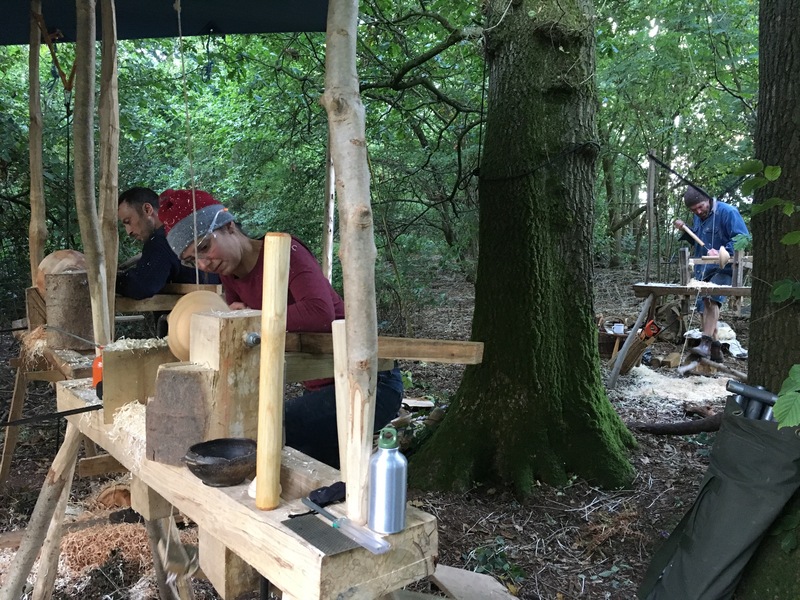 At one point I sat down and looked around; almost 20 people were busy turning bowls, cups, jugs, plates…the woods echoed with the sound of whirring cuts. Steel on wood, shavings flying, concentration etched on faces…it was wonderful! Above; James Pumfrey shaping the outside of a large beech bowl. 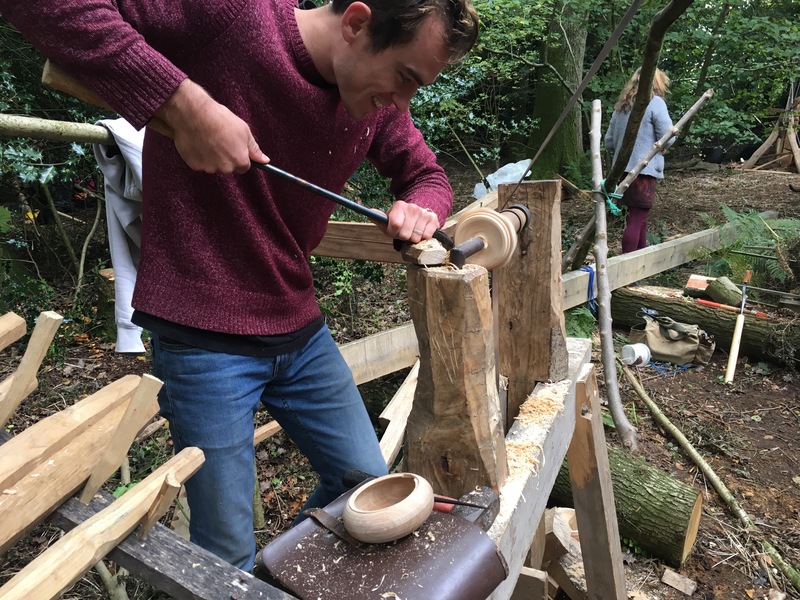 James is a very experienced bowl turner who for the last few years has won the half hour challenge at the Bodgers Ball event by turning a bowl (including the preliminary axe work) in under half an hour. He is inspired by the old turners and constantly pushes himself to work with speed and efficiency the way production turners would have worked back in the day. 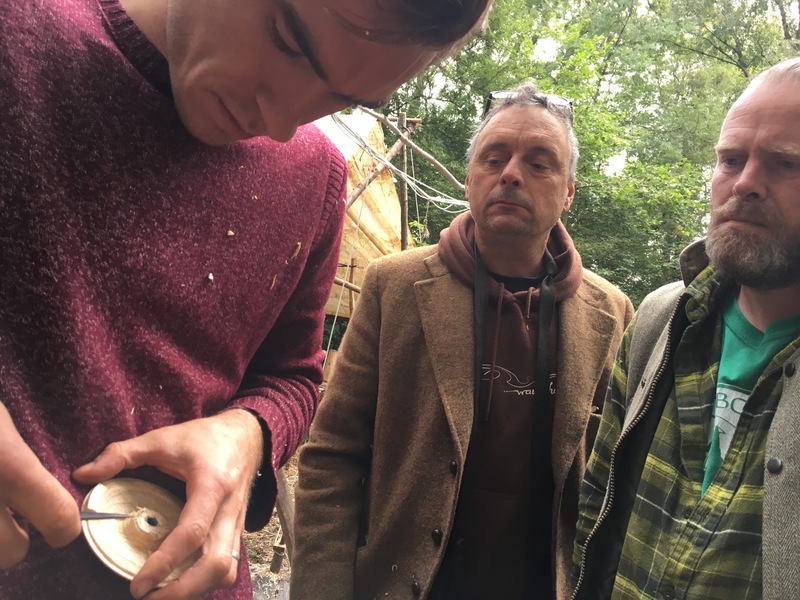 Above, left to right Jonathon Dowe, Owen Thomas and Steve Ridd all working on their copies of the Breton bowl. Above are Matty Whittaker, Amy Leake and Tom Dillon, all hopelessly lost in the spiral groove and loving every moment. 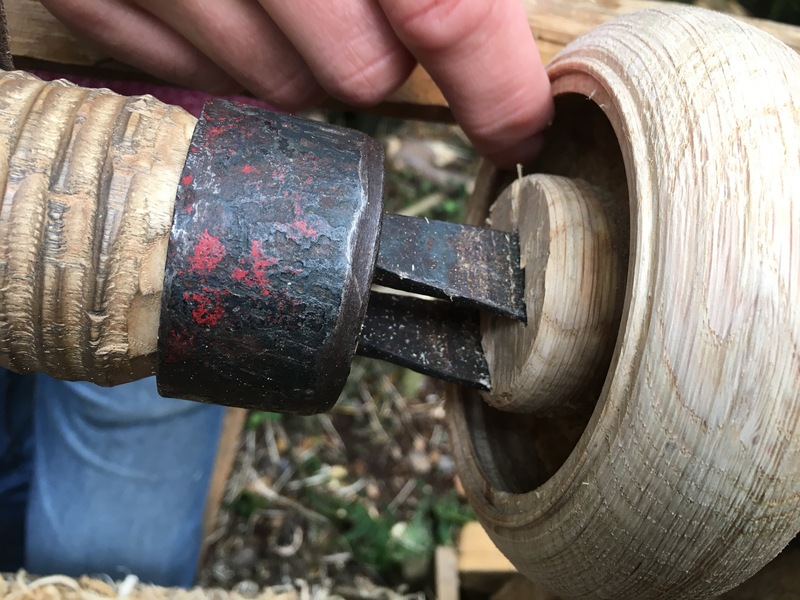 And below, Matty starting to cut a nest of bowls; the ‘Holy Grail’ of Poe lathe bowl turning and a testament not only to the bowl turning skill required but also to the ability to forge exactly the right curved hook tools for the job. He finished the nest of four bowls at the end of the day and deserves to look pleased with the result. Matty is an accomplished blacksmith and tool maker, living on a small holding in Durham where he runs courses and workshops. 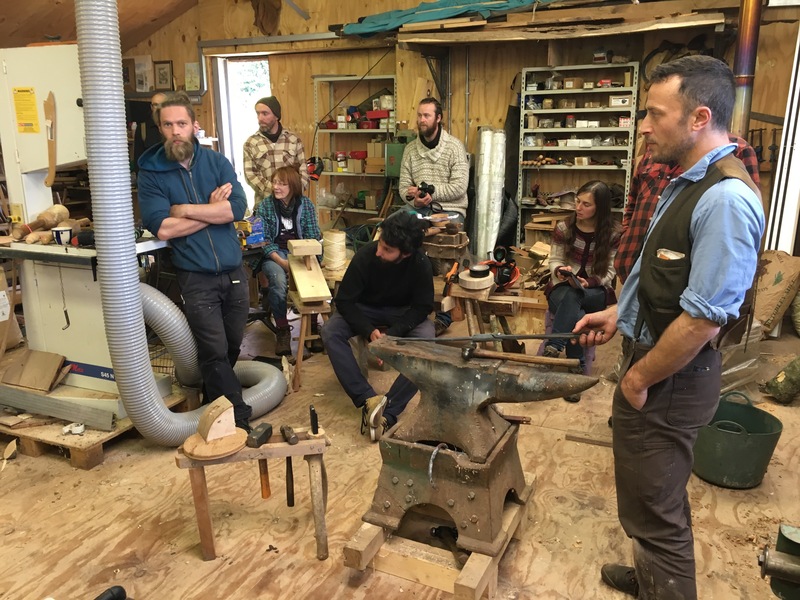 He offered to talk through nthe fundamentals of hook tool forging and heat treatment on sunday afternoon, and gave a short demo which was well received by all. 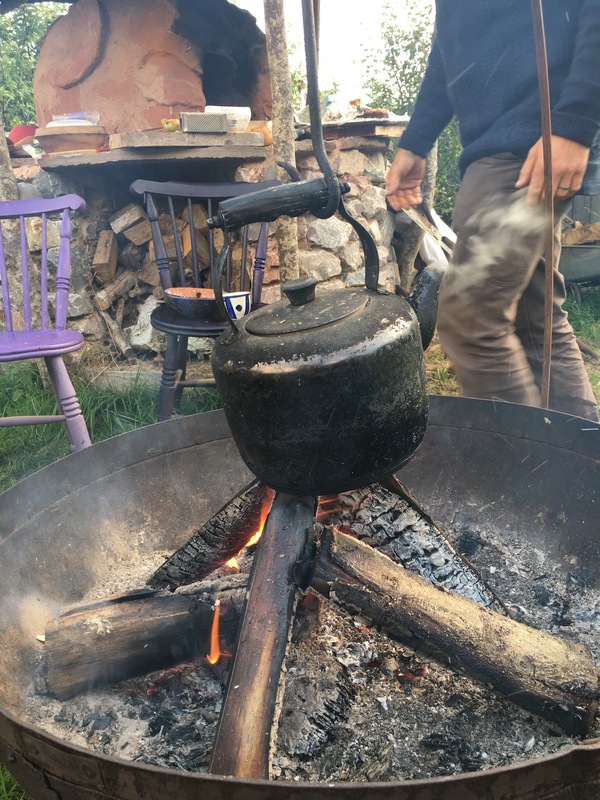 It’s easy to create a lot of hocus pocus about forging tools but it’s really very simple and Matty de-mystified the process and hopefully has inspired a few more people to give it a go. 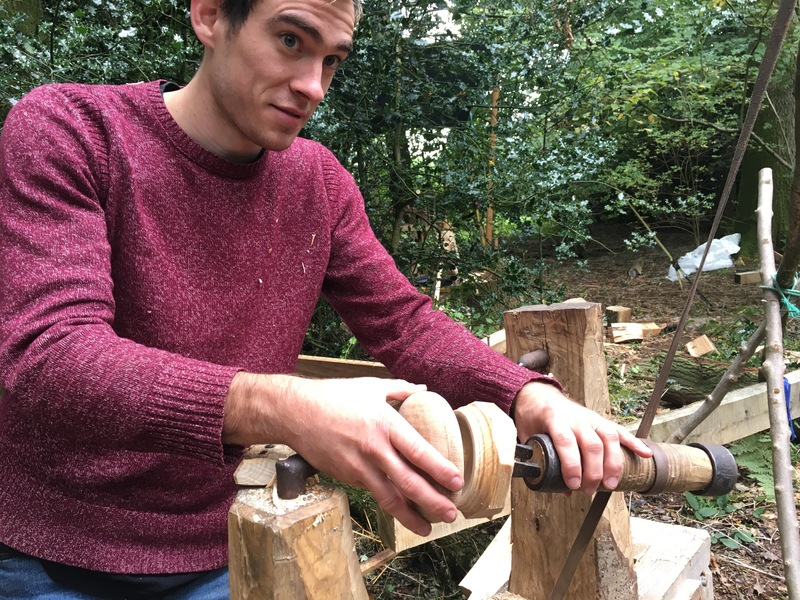 Owen Thomas kindly helped out by talking through his approach to grinding bevels and demonstrated how he does it, explaining how his method differs from some of the other bowl turners present and why. One of the things that soon becomes apparent with craft work is that there is not a right or a wrong way to do things as long as the results you get are good. If there is room for improvement, don’t be satisfied with sticking to one way but try something else until you arrive where you want to be. We also explored locking lidded boxes, an exploration once again led by Terence. He showed us how he undercuts the body of the box and how by careful measurements it is possible to cut the groove in the lid so that it fits perfectly in to the lip of the box. I have personally made just a few of these locking lidded boxes and have always needed at least three attempts to get the locking mechanism fitting tightly. It was very helpful to observe Terence and to hear his thoughts on how to organise the process methodically. Here he is undercutting the body of the box with a purpose made hook tool. Then begins the job of carefully turning the lid, and offering it up to the body to check it’s all good before carving away the excess lip which will allow the locking mechanism to work. We had a great display of everyone’s work out over the weekend, a real feast of talent and dedication and passion. 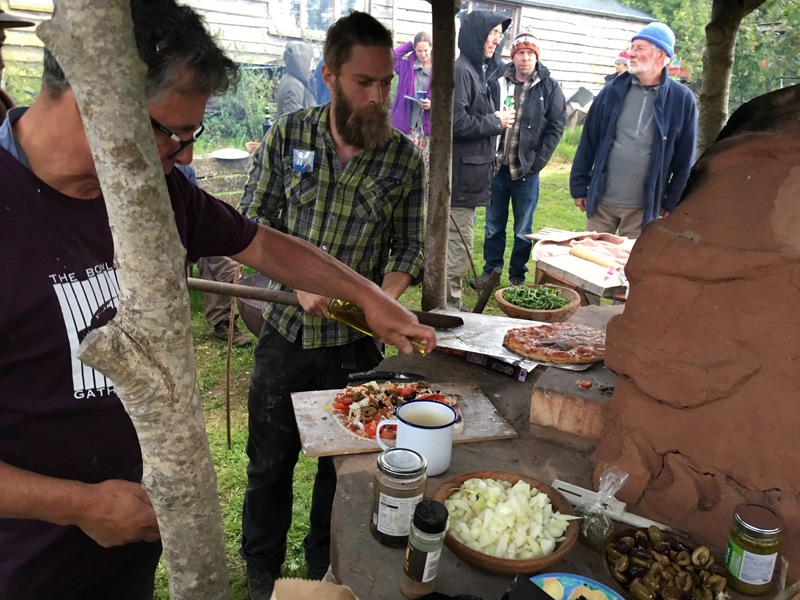 David’s pizza oven was a real treat and quickl replenished tired bodies after a day on the lathe..
At the end of the day, it was simply a wholesome time of sharing together what we love the most. The joy inherent in working with our hands, with simple tools and that wonderful material; wood. In good company. Outdoors. With a fire to see us through the night and music and singing and laughter. I am deeply grateful to know such good people and feel truly blessed to call them my friends. Over the next few days I will edit this post to add the websites and contacts of all the people who attended this event so that any readers of this blog can connect with them. 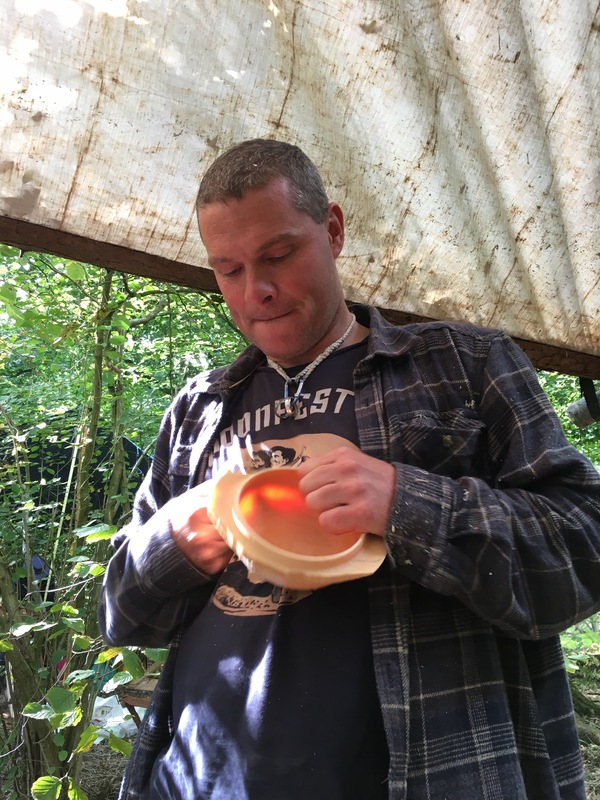 I’d like to invite anybody who might be interested in attending next years Bowl Gathering to contact me directly via my website, especially if you have something to offer by way of demonstrating for example and to subscribe to my mailing list to be kept in the loop. Wishing you all a very pleasant autumn and a productive winter. Thanks for sharing the event. I would love to move on to turning lidded boxes one day but even with your write up I still can’t get my head around them! I will have to scrape some cash together and head up to Devon one day soon.